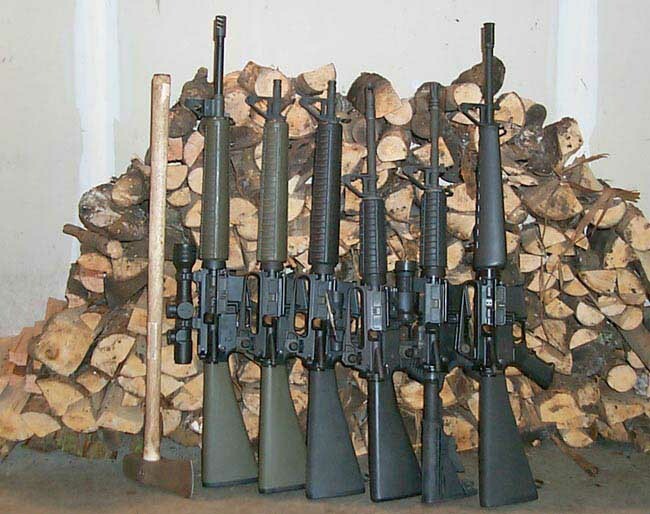 The AR-15/M-16 series of rifles was originally designed by Eugene Stoner in the late 1950’s. The then futurist looking rifle with fiberglass stocks was adopted by the military during the Viet Nam war. Currently the rifle is the undisputed high power rifle champion with accuracy many bolt action rifles can’t match. The flexible design of the rifle allows for the owner to purchase additional uppers with barrel lengths and sight configurations for nearly any task a semiautomatic rifle can be used for. There are upper receivers that range from the tiny .17 Remington up to the huge .50 BMG with cost running from about $350 up to $2500 for the upper alone. Internal parts and construction allow for the home hobbyist to assemble their own rifles. I have built five of the six rifles in this photograph. Only the left-hand rifle was factory assembled. The .223 cartridge fired by the AR is capable of some amazing accuracy and all of these rifles routinely shoot five shot groups of between one and two inches at one hundred yards. The Armalite M-15A4 on the left with it’s 20 stainless steel barrel has turned in some 5/8” groups with factory ammunition.